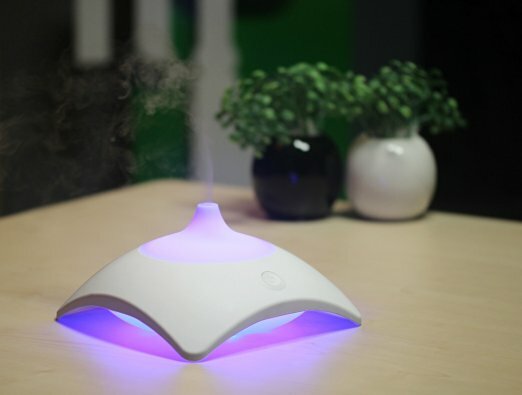 Tushar April 3, 2019 Healthy LivingTagged best humidifiers1 Comment on Best humidifiers 2019-Buy ONLY after reading this! Best humidifiers 2019 will help to add moisture to the air surrounding you by converting water into steam and moisture to make the environment much more soothing and relaxing when the conditions are too dry and irritating for your body. It is an amazing pedestal style air humidifier which can work to add moisture to the air in house size up to 2400 sq feet easily. it comes with a digital controller which allows you to maintain the perfect humidity level in the room according to your requirement with great accuracy. the small digital display on the humidifier shows the fan speed and current humidity level. Its 9-speed levels allow you to get the perfect humidity condition across the room and to maintain that level it gets shut down automatically once the desired humidity conditions are reached in the room or when the water in the tank gets finished. it comes in dimensions of 18 x 18 x 27.2 inches and weighs around 27 lbs.its advised to change its filter in 6-12 months depending on your usage. its tank size is 3.5 gallons and can run up to 60 hours but I think as per its claim of covering 2400 sq feet house, it would have been good if the tank size was bigger to cover the full house with adequate humidity. it helps in preventing unwanted flu and allergies and gives soothing effect if you have a sore throat dry skin. some people complain about noise when running at high speed and that it doesn’t cover the entire home to get the required humidity level, so if you also face this problem then you can run it at full speed of 9 to get some humidity in short span of time in the room or buy 2 humidifiers for a bigger home or choose a humidifier from other companies listed below. This Honeywell humidifier helps to keep the air moist and comfortable for breathing easily. it can be easily filled from the top without any hassle. It can be kept anywhere in the room and saves space also without compromising on the moisture output. it also features digital humidistat which shows all the important information like current humidity level etc. to analyze and set the humidifier according to your preferences. it also features turn off 24 hours timers to set as per your needs after which it will shut off or let it run till water dries out in the tank. it comes in dimensions of 9.8 x 8.7 x 24.7 inches and weighs around 11 lbs. some people complain that it produces little noise while working and it’s not good for large rooms so keep in mind these things while buying a humidifier. 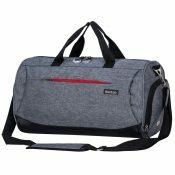 To check out latest reviews and discounted price click button below. This aircare humidifier from Essick air is meant to cover 3600 sq ft of area. 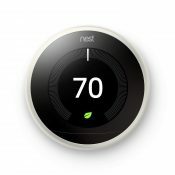 it releases cool mist from it and it also features digital humidistat which helps to maintain the required temp of humidity across the house easily and has auto shut off features to shut it down when the required level of humidity in the house is achieved or the humidifier tank has become empty. it has a tank of about 3.6 gallons which allows it to run for about 36 hours on low settings. 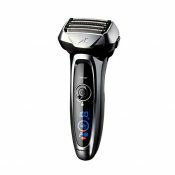 it has 3-speed motor to adjust the outflow of mist as per your requirement and night time settings for quieter operation. you also get filter change indicator and water tank empty indicator to refill it. it is easy to clean and it has evaporative wicks which deposit all the mineral components fo water. it also features little wheels for easy movement across the house.it comes in dimensions of 14.5 x 21.5 x 20.5 inches and weighs around 14 lbs. 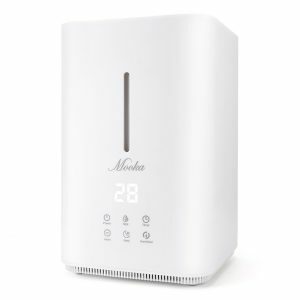 This mooka humidifier is suitable for medium and large size rooms as it comes with 4 l tank capacity which is capable to work for about 16 hours continuously to keep the environment humid and cool. once the water is finished in the tank the humidifier will shut off automatically to prevent any damage to the machine. with large tank cleaning becomes quite easy. The cotton filters on the purifier will clean the water before its diffused. air filter cleans the diffused air. this cool mist humidifier uses ceramic vibration diaphragm for producing water droplets like fog inhalent which gets delivered to the room in form of a light cool breeze making the room cool which makes it great humidifier for baby rooms, offices etc. it features 6 touch buttons to control the humidifier as per your preferences. it shows real-time humidity on its small screen along with options to increase or decrease mist up to 3 level as per your likings. you can also choose humidistat mode to automatically adjust the humidity as per your environment to make it right. the water tank is filled from the top which is quite effective and easy for water filling in the humidifier tank. Sleep mode allows set the humidifier for sleeping time with right adjustment and anion function on this produces anions in the air for 1-12 hours as per your preferences. it comes in dimensions of 8.4 x 8.4 x 13.2 inches and weighs around 5 lbs. the package also includes a brush for cleaning. 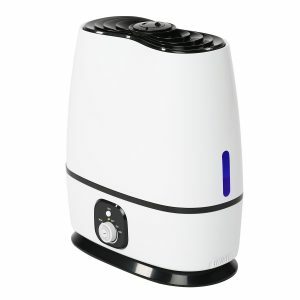 to read latest user reviews before buying this humidifier from mooka click button below. 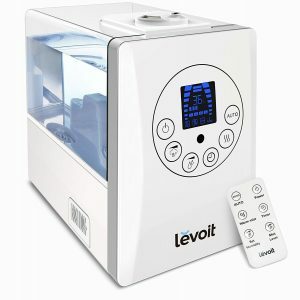 This is an amazing humidifier from Levoit with a lot of interesting features like cool and warm mist ultrasonic dispenser with 3 intensity level to make your room humid and atmosphere in good condition in less time than required by other humidifiers in the market without aking too much noise as it works on the maximum noise level of 36dB. On its small screen, you can see the current humidity level in the room to set it accordingly for a comfortable environment.to operate this humidifier without any hassle it comes with touch-sensitive control panel along with a remote control for easy control and use of this Levoit humidifier without any problems by anyone in the house. It is 6 ltr humidifier unit which is capable to work for about 20-36 hours of use in one go for adding humidity in the room size of about around 280 sq feet easily which makes it perfect for office use, bedroom, living room etc. If you turn on its auto mode then it will automatically detect the require mist level in the air and diffuse accordingly to make the atmosphere around you pleasant. Its a CE&ETL certified humidifier from Levoit which comes with a 2-year warranty from the company for issues and problems that you might encounter while its usage. It comes in dimensions of 11.3 x 7 x 10.5 inches and weighs around 5 lbs. 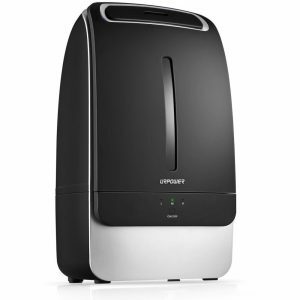 This humidifier from urpower comes with 5 liter water tank which enables to keep the room humid for a long time. its matt black body design makes it suitable for any room in the house. By long pressing the power button you can activate sleep mode which will disperse mist in medium settings and if you press the power button for short time then you can activate mist level from low, high or medium as per your preferences. it is capable to work for 14 to 17 hours in one go. when the water tank is out of the water the humidifier will automatically shut down to prevent any damages to the machine. it is easy to operate humidifier with no major learning curve and works on 30w power per hour.it comes in dimensions of 16.2 x 10.1 x 7.8 inches and weighs around 4.5 lbs. some people complain that it is a little bit noisy so keep in mind that before buying and check latest user reviews by clicking the button below. This Taotronics humidifier is quite while working and only produces maximum 38 dB of noise to help you sleep comfortably in the night and work silently with a full focus in a day. It comes with a microporous cartridge to filter the water and get rid of all kinds of microorganism for clean and pure air. It is great for room size ranging from 400 sq feet to 550 sq feet to get the room humidity at right levels for a better environment while you are sleeping or working. It comes with 4 ltr water capacity which provides you about 15 hours of mist on variable settings for better day and night. This humidifier comes with a timer, led display, along with 360-degree adjustable nozzle for evenly distributing the mist in the room. it comes in dimensions of 8.1 x 5.3 x 11.8 inches and weighs around 3.5 lbs. 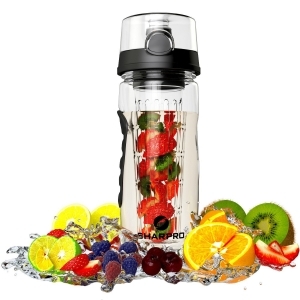 overall nice product and good design but use it with safety to avoid any kind of breakage or cracks in its plastic body while moving it here and there in the rooms. 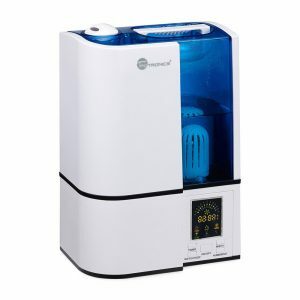 This Mistair humidifier from pure enrichment is a nice humidifier for small to medium-sized rooms. It comes with 1-gallon water tank and is good for rooms up to sizes of 500 sq feet like office space, bedroom, theater etc. it can work from 10 to 24 hours in one go depending on your moisture setting. it also comes with optional night light setting for easy operation in dark. mistairecomes with auto-off feature when the water level is quite low or tank is removed to prevent damages to the machine. it comes with disk cleaning brush in the package and also company gives 5 years warranty to keep it working for 5 long years which is great. to read its latest user reviews and then buy with discount click button below. This humidifier from everlasting comfort comes with 6 l water tank and works perfectly in room sizes up to 400 sq ft. it can work up to 50 hours continuously and quietly to keep the environment moist. It also comes with a small tray to add essential oil in it which then vaporizes and circulates across the room making it much better smelling and clean. it great to make kids, room, office, dorm room etc smell good at night and day. 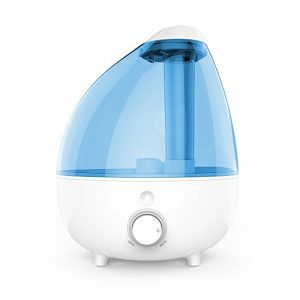 this humidifier with essential oil diffuser makes a great buy for people looking for both of them in one package. It features full 360 degrees moving nozzles and adjustable steam and mist knobs to control the humidity in the room as per your preferences. keep the right amount of humidity in the room helps to cope up with a cough and allergies. it also helps in clearing your sinuses and decreasing unwanted bacteria and microbes in your room for a better night sleep. to make the room ambiance good looking it also comes with ambient led blue light which is quite soothing to eyes. it comes with auto off features when the tank gets empty to prevent any unwanted damages to your humidifier. this humidifier does not require any filters and works with tap water. to clean the tank once in a while you can make use of normal soap water. it comes in dimensions of 14.4 x 12.4 x 7.8 inches and weighs around 4 lbs. To read its latest user reviews and then buy this economical feature rich humidifier click button below. The dry atmosphere at home can lead to dry skin, cracks, and wrinkles in the skin. lotions can help up to a certain limit but having moist air around and in your house can help you cope up with dry skin as the skin will absorb moisture from the air and become normal and soft again easily. 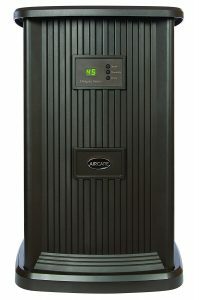 dry air can increase the intensity of symptoms which can cause more issues and discomfort with your allergies and asthma so it is always better to keep the air moist with the help of humidifiers if you live in a dry area as it will help to clear the nasal passage and reduce the number of allergens in body and atmosphere which will help you to relax and prevent these unwanted issues with your body. too dry air can be a cause of cracks and split in the wooden floors, furniture, doors etc in the house so if the air becomes too dry then you can buy a humidifier to bring humidity back in your house for the serene and good environment. indoor plants also need water to survive from soil and surrounding air which can be provided by humidifier to help them grow. if the air becomes too dry then plants may get dry and leaves will become pale yellow. 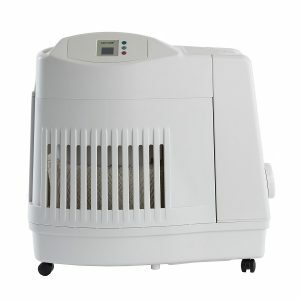 humidifiers come with various different tank sizes which you can buy depending on your requirement. like for a small room you can buy one with small tank size but for bigger areas like dining rooms, basements etc. Humidifiers with bigger tanks are good to use. also, small tanks require filling frequently but bigger tanks require less and can be used for a long time. Also, check whether it is easy to open and fill the tank fast or it requires some understanding and adjustment then buy the best one which suits your humidification needs of the area you wish to put it in. Humidistat allows you to control the humidity in the room and set the humidity level you want. It shows you the current humidity level of your surroundings and allows humidity manipulation by turning on the humidifier when the room becomes too dry which makes it an essential feature in all humidifiers. make sure that your humidifiers give you options to apply and change different filters when they get dirty after some time. the filter helps you to keep the air clean in the room and prevent unwanted bacterias to spread in the room which can cause you harm. some latest models which do not requires filters are also becoming popular but they require regular cleaning. so you can buy the one which suits you the most but you will have to clean the humidifier once every few months to keep it running in good condition. Can humidifiers destroy the electronics in our home? humidifiers don’t harm or destroy the electronics items and wood furnishing in our home. the electronic equipment works normally when conditions are humid so a reasonable amount of humidity in the room is ok and doesn’t cause any concerns for electronic shocks or other issues with electronic items in the home. as far as wood items are concerned little moisture will make them shiny and dust free but too much for too long can effect on them and cause issues like molding and wood destruction but in general, humidifiers is not a major concern for wood items in the house. when should I change my humidifiers filters? generally, it is advised to change your humidifiers filters once every 3-4 months but if it gets dirty and mold mildew grows on in faster due to heavy use daily then you can change the filter in 2 months also to keep your home humid with clean air without circulating dirty air from the humidifiers across your house. What’s the ideal humidity level should I maintain in the house with humidifiers? To keep your house surroundings at right humidity level its must that you know what the current level which you can measure with a hygrometer or just look at your humidifier if it comes with inbuilt hygrometer and then humidity level required in it, sometimes it automatically also manages and keep the humidity at the right level. Ideal humidity level for a family home stands at 30-50% in the atmosphere as anything above 50% will make the atmosphere too wet which will turn your house into the breeding ground for all sorts of unwanted elements like bacteria, viruses, molds, mildew etc. Also if you keep it below 30% then the atmosphere will become dry which will start causing breathing issues and other illness like flu, hold cold body etc besides that if you tend to keep humidity below 30% for prolonged period of time in your surroundings then your house foundation and wood furniture can also suffer as they may develop cracks in them which is not good. So its advised to keep the humidity at the ideal level of about 40% in your home with the help of good quality humidifiers shared above. when using humidifiers in a room with a open windows then its advised to keep them closed along with the doors while the humidifiers is still on to prevent any contaminated and dry air to enter the room which can destroy the filter faster and put extra load on humidifier to make room humid as the humid air will go out easily making the room dry faster than expected and then you will think it is not working as expected. If you like our collection of Best humidifiers 2019 given above and you were able to find the right one for your need then let us know your review about it and also share this post with your friends and family as it would help them to make their air humid too with these top-rated humidifiers in 2019 and beyond. Hey HOH – Great best of list!! There are so many types of humidifiers when you go to the store so this is really helpful. I never really thought about the preserving wooden furniture tip, but that makes a lot of sense. Looking forward to reading more of your posts.